Latest price of Realme 1 64 GB in India was fetched online from Flipkart, Amazon, Snapdeal, Shopclues and Tata Cliq. 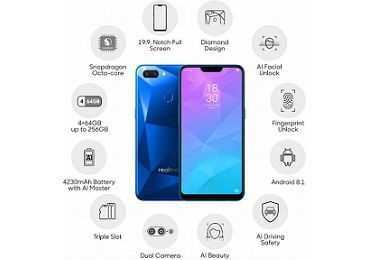 Be it the looks or specifications or cost; Oppo RealMe 1 has transpired to take the lead. Launched in May 2018, the phone has an attractive glass diamond cut and solar red back designs that gives it a premier feel. The new app split-screen feature allows you to do multiple tasks simultaneously by splitting the screen view into two halves. The phone runs on a 12nm technology Helio P60 octa-core processor with a clock speed of 2GHz. The phone comes with servings of Artificial Intelligence(AI) and Machine Learning. The face recognition and unlock feature is also a flaunt and works smoothly, but it can be a little bothersome in the nighttime with very low light. The phone is power packed with features compared to the other phones of its price range. Weighing 158 grams, there are 3 RAM variants – 3GB, 6GB, and 4GB. It also has dual 4G nano SIM slots with dual standby. The gadget switches between tasks without any hiccups even while running heavy gaming applications. The feature called ‘Quiet Time’ can be used to put your phone on silent mode for a specific time of the day. It has an 8MP front camera and a 13MP rear camera. AI plays its magic with the Beauty Technology 2.0. It can detect the features in the image and adjust the contrast and brightness accordingly to give you great pictures. The details are great for a phone camera with ample manual settings. Storage capacity varies with the RAM size. The 6GB RAM variant provides 128 GB storage, 4GB RAM comes with 64GB and 3GB RAM with 32 GB storage spaces. Also, a dedicated microSD slot with up-to 256GB expansion is available. The Clone App feature allows you to run a copy of any app simultaneously with the original applications. The 128GB storage variant would be the best deal to get the most out of this piece of gadget. Despite all the power packed features, battery life is a major concern for every user. Oppo has provided a 3410mAh battery with AI support. The phone understands your usage pattern and closes the background applications to save power. Complete charging of the battery takes close to 2 hours. The 6-inch screen has an FHD plus display and a resolution of 2160x1080 pixels with an aspect ratio of 18:9. The night shield mode prevents straining of eyes by turning off the blue light. It comes with an array of connectivity options like WiFi, Bluetooth, GPS, 3G, 4G LTE, GSM, HSPA, WCDMA, FDD, TD, and micro USB. Other features include magnetic induction, proximity sensor, Light, acceleration, and G-sensor. Oppo RealMe 1 runs on Android Oreo 8.1 with ColorOS 5.0 that has gesture control support. The game acceleration mode delivers memory exclusively for the game and safeguards the phone from heating up. Features like looks, performance and OS, makes this phone an impressive package in its range.